Although several past studies have investigated the formation of crystals from identical particles, the conditions under which non-uniform particles crystallize and the crystals resulting from this process are still poorly understood. In a recent study published in Physical Review Letters (PRL), researchers at Friedrich-Alexander University Erlangen-Nürnberg have gathered interesting findings about the formation of complex crystals from size-disperse spheres. Identical particles, such as atoms or colloidal particles that are synthesized to be similar to one another, are known to have low dispersity. Dispersity is a measure of the heterogeneity of the sizes of particles or molecules in a mixture. Crystallization is a very common phenomenon in identical particles, yet it is far harder to achieve when particles have different sizes (i.e. high dispersity). Even after they undergo a synthesis process, particles often exhibit significant dispersity, particularly if the synthesis process is not carefully controlled. "Our research shows that dispersity, while inhibiting crystallization, does not forbid it entirely," Michael Engel, one of the researchers who carried out the study, told Phys.org. "Instead, new types of crystals appear via a process called fractional crystallization. Fractional crystallization has many technological applications and relevance in geology. 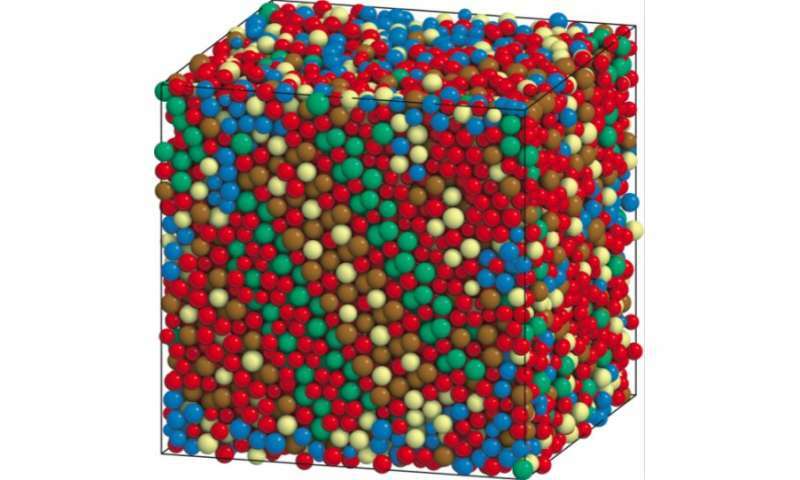 Our work is the first to confirm the precise nature of fractional crystallization in the simplest particles possible, hard spheres, systematically using advanced statistical simulations." In their study, Engel and his colleagues used advanced computer simulations to model the motion and rearrangement of particles over time. While doing this, they used a special numerical 'trick' to swap particles with their neighbors and re-size them, as this can significantly speed up the simulation process. "Previous methods did not employ this trick systematically as a function of the size distribution and the density of the system," Engel explained. Engel and his colleagues demonstrated that hard spheres with a Gaussian radius distribution and dispersity up to 19 percent always crystallize if they are compressed slowly enough. In addition, they observed that this crystallization occurs in surprisingly complex ways. "We figured out that disperse particle populations crystallize successfully and how they do so," Engel said. "In practice, some softness of the particles, long times, and a concept called dynamic dispersity (continuous adjustment of size, shape or charge) is important to speed up the crystallization process. In fact, some of our predictions have already been successfully reported before in experimental systems involving atoms, nanoparticles with organic linkers, and soft micelles (like nanoscopic soap bubbles)." The study carried out by Engel and his colleagues offers valuable new insight into the formation of complex crystals in hard spheres, showing the circumstances under which it can occur. Their observations also suggest that there might be a link between disperse particle systems and alloys, which are metals made by combining two or more metallic elements together. 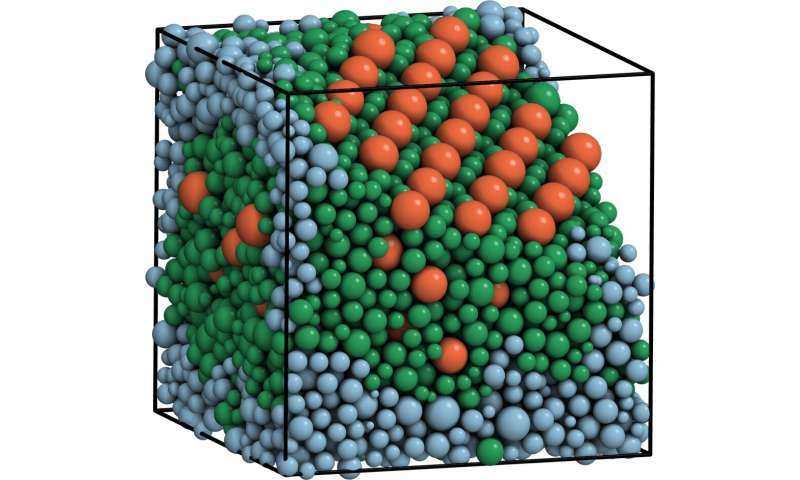 "Our results hint towards a close connection between disperse particle systems and alloys, as the complex crystals (Laves phases and other Frank-Kasper phases) that we observed are traditionally well-known in alloys." Engel said. "In the future, the simulation techniques we developed could be applied to other mixtures of particles that are technologically relevant."